This is the first in a series of posts about the things that I will, and will not, miss about the big city. There is a legend that Mayor Michael Bloomberg, the 13th richest person in the country, rides the subway to work at City Hall everyday. I don’t know if it’s true or not, but the fact that people could take it seriously speaks to the greatness of the New York City subway. Visitors think it’s intimidating and scary, dirty and stinky. There’s probably some merit to the last two, and it can be intimidating if you’ve never used a metro anywhere else. But scary? No way. In fact, the MTA might be the most functional democratic institution that exists in the United States: Every day, people from every income bracket, political preference, religion, sexual and gender identity, education level, and from most countries on earth, get on the subway to go to work or school or to do some tourist-related activity. In half an hour, I can ride a 6 train from Central Park and some of the wealthiest zip codes in the world to the South Bronx and the poorest congressional district in America. In thirty-five minutes, the L train will take me from Brownsville, the city’s most dangerous and depressing neighborhood, to Williamsburg, bastion of privileged white protracted adolescence. And people who live in all of these neighborhoods, and all of the ones in between (like the one where I live) ride the train together. Why? Because it’s cheap, efficient and goes just about everywhere. Recently, I had to take a cab home from Newark Airport in the middle of the night. It only took half an hour, but the tolls alone cost $20, one way. The entire ride cost $80! If I had been an hour earlier, before New Jersey Transit shut down for the night, I could have made it home for about $6. 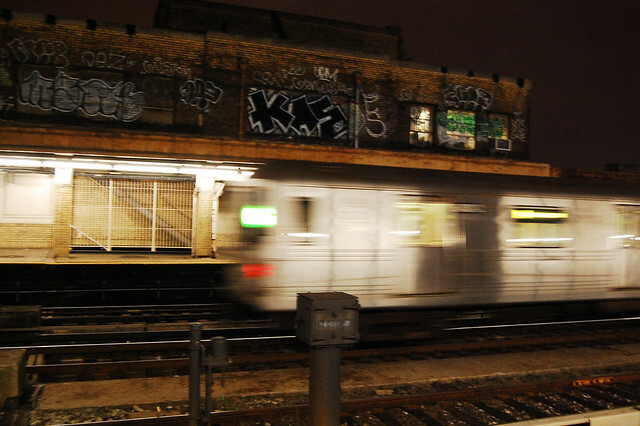 The NYC subway never shuts down for the night — no drinking and driving, no finding a place to park, no worrying about other drivers. Have I had miserable subway experiences? You bet. I’ve been masturbated upon, harassed by proselytizers, stuck in tunnels without air conditioning and, on two different occasions, I have cradled people as they collapsed against me and proceeded to have seizures on crowded, rush-hour trains. But these have been few and far between, and can mostly be chalked up to bragging rights (except for the masturbator, may he rot). The train connects people literally, but it also connects us in other ways. You know that really good mariachi band on the L train? The break-dancing kids who never crash into anything? Those skinny twin brothers who, pretending to be only one person, ask for money in their high-pitched monotones? I may not know you, but if you ride the train with any frequency, both of us know these people. In such a huge, fractured city, that’s pretty amazing. I *love* that mariachi band! Do you know the Asian woman who sells bootlegs on the 2/3 uptown? I’m actually still carrying around MTA tickets from our 2008 and 2010 trips — every time I think about recycling them, I think of another fun subway memory and put them back in my wallet.